WASHINGTON (Jan. 27, 2011) -- Iowa lawmakers honored fellow Iowan, Medal of Honor recipient Staff Sgt. Salvatore Giunta, during a ceremony Jan. 26, on Capitol Hill. Giunta was awarded the Medal of Honor, the nation's highest military honor, Nov. 16, 2010, by President Barack Obama, for his actions in Afghanistan's Korengal Valley in October 2007. Medal of Honor recipient Staff Sgt. Salvatore Giunta, center, was honored Jan. 26, on Capitol Hill, by a delegation of lawmakers from Iowa - Giunta's home state. The lawmakers included Rep. Tom Latham, Sen. Tom Harkin, Sen. Chuck Grassley, Rep. Leonard L. Boswell, Rep. Dave Loebsack, Rep. Steve King and Rep. Bruce L. Braley. The lawmakers presented Giunta with a framed copy of a joint resolution of Congress. The Jan. 26 event in the Capitol included the presentation by a delegation of Iowa lawmakers of a congressional joint resolution recognizing the service of Giunta, as well as words from the senator from Hawaii, Medal of Honor Recipient Dan Inouye, who served as the keynote speaker. "There is one thing common about all recipients of the Medal of Honor," said Inouye. "Whenever they get it they will say how come me? What about the others?" Inouye received the Medal of Honor for his actions in Italy during World War II. "America is so blessed with people like Salvatore Giunta -- that makes America different -- different from the rest of the world. That makes America strong," the senator said. "Nothing we can say would be enough to thank Staff Sgt. Giunta. But as one who also received the medal, I can say I am proud to be in his company." Sen. Tom Harkin of Iowa said Giunta's actions clarify the meaning of the word hero in the American lexicon. "Staff Sergeant Giunta gives meaning to the truth that our real heroes today are not on our movie screens or in our sports arenas, and they are not avatars," Harkin said. "Our real heroes are serving our nation in uniform." Harkin went on to say that Giunta personified some of the best attributes of Iowa. "I respect his Iowa brand of modesty, which is totally genuine," Harkin said. "And I see in him other qualities that we prize in Iowa, including his powerful sense of purpose, of duty, honor and country. Sergeant Giunta, you make us proud. You represent America and Iowa at its very best." The Iowa delegation, including Harkin, Sen. Chuck Grassley, Rep. Tom Latham, Rep. Leonard L. Boswell, Rep. Steve King, Rep. Bruce L. Braley, and Rep. Dave Loebsack presented Giunta with a framed copy of the congressional joint resolution. 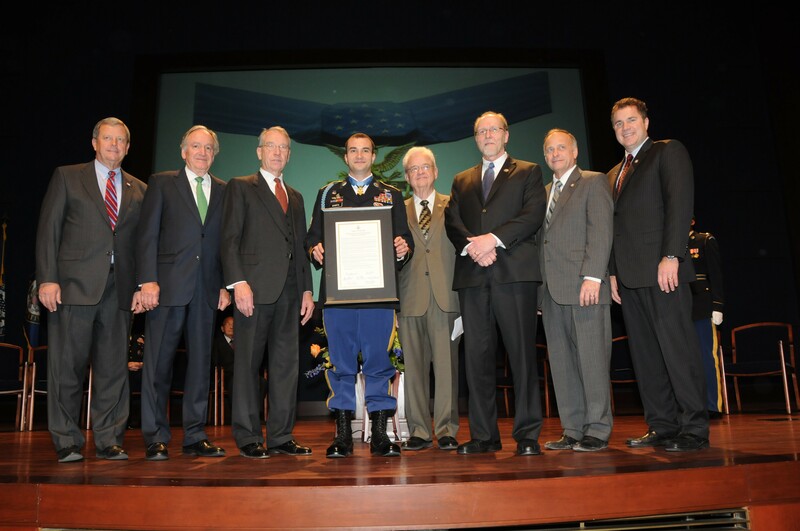 The resolution "honors the service and sacrifice of Staff Sergeant Salvatore Giunta of the United States Army," and also "encourages the people of the United States to recognize the valor and heroism exhibited by Staff Sergeant Giunta." Giunta was modest in acceptance of the presentation, citing others as instrumental in his own actions. He called out to fellow Soldier, Spc. Garrett Clary, who was in the audience, and asked him to stand. "It means a lot to me to be able to have him here," Giunta said. "He was my 203 gunner for about 12 months of a 15-month deployment. He was there Oct. 25, 2007, in the Korengal Valley. We were involved in the same conflict and the same incident and we both did everything we could to help the man to the left of us and the man to the right of us." Giunta cited others who had been in Afghanistan that day as well -- including Sgt. Joshua Brennan and Spc. Hugo Mendoza -- both who died during the combat that day. "There are people every day who don't get to come back to their families -- a hug and a kiss -- and a welcome home," Giunta said. The evening prior, Giunta attended the State of the Union address as guest of First Lady Michelle Obama. "It was a really great experience," he said. He'd previously met the first lady and president at the White House. "To come to the U.S. Capitol in Washington, D.C., and to sit next to her, and to listen to her husband. It's monumental for me." Currently, Giunta has been visiting units around the Army, talking with Soldiers and other Americans who want to hear about how he earned the Medal of Honor. But soon, the noncommissioned officer will leave the Army and he plans to attend college. "I hopefully will find my way to Colorado and I'm looking at hopefully Colorado State," he said. "I'm looking at either of two things, business or natural resource management. I don't really know, but I know knowledge is power and I'll just see where it takes me."